So begins Brian Turner’s My Life as a Foreign Country, a start that just barely illuminates the the work’s enigmatic title and strange epigram taken from Eugenio Montale: “Too many lives go into the making of just one.” Half-memoir and half-rumination on the cosmology of soldiering and combat, My Life as a Foreign Country blends crystal-clear accounts of Turner’s upbringing in California and service in the Army with historical digressions, hallucinatory alterations of the here-and-now, and imagined vignettes describing the lives and thoughts of a cast of characters ranging from Iraqi bomb-makers to Japanese kamikaze pilots. It’s a lot to absorb, and matters are not helped by the subdivision of the book into 11 unnamed chapters further broken into 136 smaller sections, titled only by numbers, ranging in length from a sentence to a few pages. There’s kinda-sorta a logical narrative progression from chapter to chapter and within each chapter, but the trail is faint and easily lost, especially on the first reading. For sure there’s work to be done trying to explain the literal progression of Turner’s narrative, for those who like their readings literal, but clearly My Life as a Foreign Country is meant more to be experienced than explained. Even so, I’ll offer a few general comments about Turner’s methodology and vision. The most stunning passage in the book, by far, is a reworking of a Rick Moody poem called “Boys.” Rendered in prose form by Turner and given the prosaic chapter title name of 49, we can do better by calling it by its first line: “The soldiers enter the house.” What follows is four pages of insanely intense and vivid and evocative description of the lives and thoughts of soldiers conducting a midnight raid on a compound belonging to a scared Iraqi family. A small quote won’t do it justice, but even a snippet such as, “The soldiers enter the house with only nine credits earned toward an associate’s degree in history from the University of Maryland. They kick in the door and enter the house with the memory of backyard barbecues on their minds” displays Turner’s gift with words and, even better, his ability to see poetic potential in mundane facts. The passage is incantatory even when read silently, and is even more so when read aloud, as I have heard Turner do so in performance. My Life as a Foreign Country decidedly departs the time-space continuum in its later stages when Turner straight-facedly describes an RPG hit that kills him: “Sgt. Turner is dead,” he writes. The author-Turner is not dead, of course, but the imagined death, I’m thinking, bespeaks the author-Turner’s desire, at long last, to put his identity as a soldier behind him, a problematic venture given that it is his identity as a warrior that has inspired his poetry and gained him a paying audience. But noticeably absent in a memoir by an accomplished author are extended descriptions of Turner’s writerly development before joining the military, while in, and afterwards. 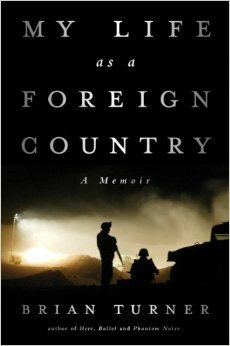 To parse the book’s title, then, we can say that the “foreign country” he speaks of are the parts of his life—boyhood and a short period in adulthood—when he was consumed by soldiering, not art. The two clearly have never not been connected for Turner, but My Life as a Foreign Country foregrounds contemplation of the first, while leaving his literary life for another day. Whitman concludes, “Failing to fetch me at first keep up encouraged / Missing me one place search another / I stop somewhere waiting for you.” I can’t state exactly what Sergeant Turner is up to at the end of My Life as a Foreign Country, but since I know him not just as a gruff former NCO but also as a sweet soul who cares deeply, I’m not surprised to read very near the book’s conclusion that, “because Sgt. Turner is dead, he will remain at his post.” Like Whitman at the end of his own long poem, Turner is somewhere ahead looking out for us while we scramble to catch up. Brian Turner, My Life as a Foreign Country. Norton, 2014. I read an early draft of My Life as a Foreign Country and am honored to be mentioned in the acknowledgements. This entry was posted on September 15, 2014 at 3:21 pm and is filed under Art and War. You can subscribe via RSS 2.0 feed to this post's comments.